With a brand new album, Seal The Deal & Let’s Boogie, out now, Danish rockers VOLBEAT have revealed a series of North American tour dates. The ticket pre-sale began Tuesday, June 7th at 10am local time, with the general on sale starting Friday, June 10th at 10am local time. However for Fargo, ND the pre-sale begins Tuesday, June 14th and general on sale Friday, June 17th. 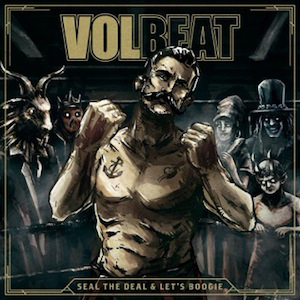 Produced by longtime collaborator Jacob Hansen and co-produced by frontman Michael Poulsen and lead guitarist Rob Caggiano, Seal The Deal & Let’s Boogie includes a total of 13 new tracks, reflecting VOLBEAT's signature hybrid of rock prowess, metal power, blues soul, and rockabilly swing.